Guatemala ties with Nicaragua as the poorest nation in the western hemisphere with the average Guatemalan earning less than $200 a month. There are a surprisingly large number of children with disabilities in this country for a number of reasons. First of all, the chronic malnutrition rate for children under the age of 5 is 49.8%, the highest in the region and the fourth highest in the world. This means that one out of every two preschoolers suffers from chronic malnutrition. The malnutrition rate among the indigenous Mayan people is even higher. To those most affected, chronic malnutrition is just a part of life. The rural poor, who are mostly indigenous, subsist on a diet of frijoles, tortillas and coffee. Parents in these areas will tell you it's always been this way. How does malnutrition impact disabilities? Malnutrition of pregnant women significantly increases the number of birth defects, and lack of adequate nutrition during the first two years of life often affects cognitive as well as physical development. Couple this with the fact that, especially in rural areas, there is little, if any, prenatal care and most births occur at home, often assisted only be a midwife with little or no formal training, and the causes of the high incidence of disabilities in children becomes apparent. Furthermore, while the law requires that children with disabilities be allowed to attend school if they so desire, in many cases this law is ignored. If children are admitted to school, they are often neglected, ridiculed and even abused. If special education classes are available, the curriculum focuses more on arts and crafts than on any type of academic instruction. 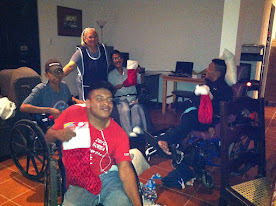 Finally, the Guatemalan government provides no additional social or support services to the disabled and their families. What is our donation used for? Ninety-eight percent of all donations given to the Josiah Foundation on our behalf are used directly on the mission field. For a breakdown of current spending for the 2014 calendar year, click here.